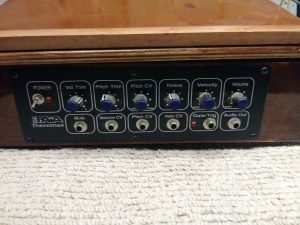 “Here we have a PAIA ThereMax Theremin which I built approximately 20 years ago and used very little. It is 100% solid state and includes a “wall wart” DC power supply. It is built inside of the PAIA wooden lectern case. Very good condition! (this unit with the wooden lectern case costs over $230 from PAIA and then you have to build up all of the electronics and finish the lectern case).